To connect to Openfire from an XMPP Client, please check that ports 5222 and 5223 are opened for remote access. Refer to the FAQ for more information on this. 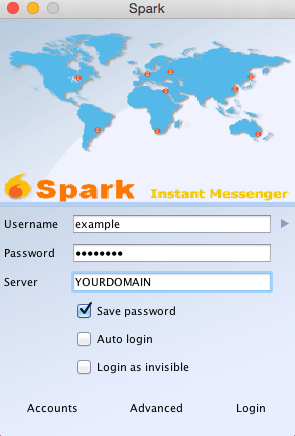 You can use any XMPP client but this section documents Spark. Spark is an Open Source, cross-platform IM client optimized for businesses and organizations which is the easiest and best alternative to use in combination wiht Openfire. Log in to the Openfire Administration Panel and create a new user. Open your Spark client, fill the required information and click the “login” button. You must indicate your user, password and the IP address or hostname of your Openfire server.